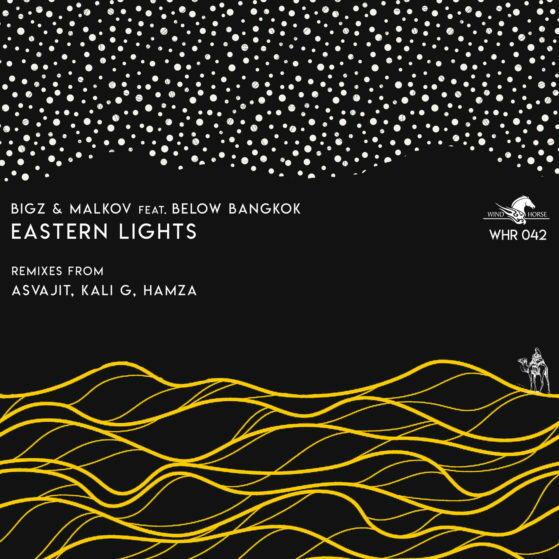 Wind Horse records is ecstatic to present our next major release for the year 2018 which comes from veteran DJ & Producer Adel Ghandour AKA BigZ (Canada) formerly known as Big AL, prodigal DJ/Producer Malkov and Amir Jeshari Aka Below Bangkok (Croatia).The exciting triad join forces and frequencies to land the ‘Eastern Lights’ EP with remixes from the label’s founder Hamza and Kali G. The EP is a representative vision of the global influence and fabric that bind the tapestry of music that’s released on Wind Horse records. ‘Eastern lights’ is a gorgeously crafted ethereal dub-techno groover that could inspire visions of space, time and the introspection of time. Unhurried and unabashedly laid-back the track is characterized by a lush, enveloping pad that entrances the listener straight away. The track is complimented by simple yet effective drums & percussions that mirror the groups minimal affinities. The track can be described as an aural trip through the cosmos of space, interpreted by ably by the trio. A subtle and round bassline accompanies ensemble and makes this a perfect weapon for the early hours and the afterhours. On remix duties, Hamza renders his own interpretation of ‘Eastern Lights’ with an alluring, ethnic remix that leans toward the more mystical side of his music making capabilities. The track is more dance-floor friendly but retains its hypnotic influence and Eastern Soul. Hamza’s unique individuality and sense for harmonies are easily audible and recognizable. A more than apt vocal sample is layered effortlessly over the vibe and shows itself fleetingly, adding to the lure of the remix. Sri Lankan producer Asvajit lends his expertise to conjure a refreshing remake of the original track with an excellent remix. Staying true to the original, the remix is driving and easy going at the same time. The track has almost a dub-minimalesque touch to it interspersed by well-tuned atmospherics and transitions and complimented by Asvajit’s innate ability to craft dance-floor weapons time after time. Not to be left out Kali G also steps up with his version of the single which is stripped down, busier and is peppered with piano stabs, vocal stabs and tropical rhythms. Relentless and addictive, this tune is tailor-made for those high-octane dance floor moments. A slight departure from his more melodic works, Kali’s remake of eastern lights showcases the incredible versatility and understanding of the dance floor that he brings to the table with every single track that he works on.